This article first was published by ExploreUtahScience.org under the title Explosion in Urban Beekeeping Raises Concerns for Honeybee Population on October 25, 2012. Millions of buzzing residents have moved into Utah, as the number of new beekeepers registering with the state has increased eightfold since 2006. That’s good news for local farmers and gardeners who depend on honeybees to pollinate their crops. The bad news is that the new arrivals could be bringing with them a rash of problems. Several honeybee experts worry that in the hands of novice beekeepers, all those hives could become incubators for viruses and pests ready to hitch a ride to any of the thousands of commercial hives around the state. Clint Burfitt suggests that this concern has been fueled by a fundamental shift in the scale of risk that face beekeepers today. “In the past, a [commercial] beekeeper could keep 1000 hives and might lose a few [to disease], but now a commercial beekeeper can have losses of 60 percent.” Burfitt is a state entomologist at the Utah Department of Agriculture and Food. Colony Collapse Disorder, the nationwide phenomenon that first hit the news in 2006, contributes to these losses. By some estimates, the disorder is blamed for killing one quarter of the nation’s bees, resulting in a $12 billion loss to the agricultural economy. Some beekeepers fear that should pest and viral infection spread to commercial apiaries, the results could be similarly devastating. “If one person isn’t knowledgeable or just doesn’t understand how to recognize or treat for [pests and pathogens], that jeopardizes everybody in that system,” says Burfitt. “People get all fired up about [starting their new hives]. It goes pretty well at first, but summer gets busy and they let it languish. If it craps out, this time of year, robbers come looking for weak hives. Robber bees come in, pests jump ship and join the new hives,” says Chris Rodesch, Salt Lake County bee inspector. This activity can initiate a cycle that quickly infects an entire neighborhood of hives. However, Rodesch maintains that commercial bees experience more risk of exposure when they are rented to farmers to pollinate crops, a common and lucrative practice. They are often trucked long distances and forage alongside bees from other parts of the country. Should an outbreak of a particularly pernicious virus occur, the Department of Agriculture and Food is equipped to notify registered beekeepers and offer advice on symptoms and treatment. The Utah Bee Inspection Act mandates that all beekeepers register their hives with the department within 15 days of setting them up. Nevertheless, there are shortcomings to the system. 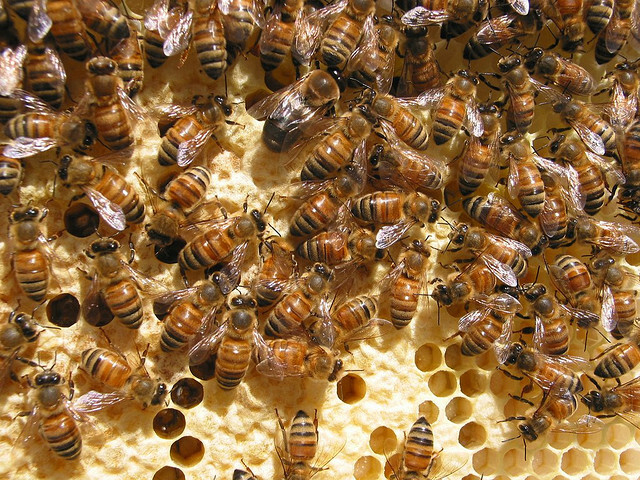 The inspection act does not require beekeepers to submit notification of hive losses. Such a requirement could make a big difference in identifying pests and pathogens before they reach the level of outbreak. Further, many of the state’s beekeepers are either unaware of the registration requirement or unwilling to register their hives. Rodesch says that only half of the hives that he visits are registered with the state.